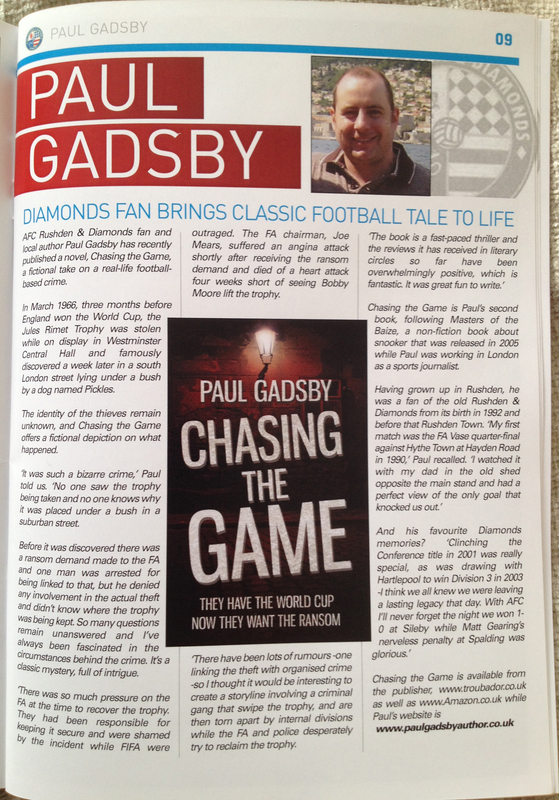 The matchday programme of my local football team, AFC Rushden & Diamonds, published a feature about Chasing the Game in its latest issue. 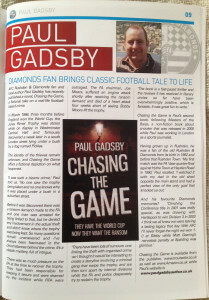 The in-depth feature included an interview with me that focused on the storyline and background of the novel as well as my history in supporting the Diamonds, which goes back to 1990 when the club was known as Rushden Town. In June 2014 the AFC Rushden & Diamonds programme, edited by Stephanie Webb, won the Programme of the Year award for the entire United Counties League, which has 41 clubs over two divisions. Chasing the Game of course has strong links with football, depicting a fictional version of the real-life theft of the Jules Rimet trophy in London ahead of the 1966 World Cup. The crime thriller has received a raft of glowing reviews since its release, including from Britain’s biggest crime websites Crime Fiction Lover and Crime Time. For more details about the book and the true-life crime that influenced its narrative, please click here. For more details about AFC Rushden & Diamonds, please click here.